It's been a busy week here! Friday Dave's work had it's annual Lagoon day, so we dropped Logan off at Grandma's house, rode some roller coasters, swam at Lagoona Beach (and rode all the water slides), ate at the work BBQ, and called it a day! Dave loves roller coasters, so he looks forward to this day all year. It was fun because there were no lines (we walked onto Wicked twice without waiting) but 98 degrees! Saturday and Sunday were the day of plumbing disasters! Our sprinkler line broke, so we worked for hours trying to fix that (still needs work, but we're hoping to get it figured out by Friday). Our bathroom sink and bathtub started draining slowly, so we worked on those for quite a while (fixed the sink, but can't figure out how to get the snake around the corner for the bath tub...). Then Sunday the bathroom sink downstairs decided to start leaking! For that one, the entire pipe had corroded so when I unscrewed everything (the tightener pieces shattering as I twisted it) and pulled to remove the old pipe, the pipe shattered in my hand! Being metal, that was a big shock. Monday we were able to fix that one, and take a little break from all things plumbing. Sunday we also started our new calling - Leader of the Nursery Leaders. This sounds far more involved than it currently is. Right now we are the only nursery leaders (they used to have 7, but they released them all upon calling us). Eventually we'll get to work out a schedule where some leaders are in the nursery each week, giving one couple a week off every so often. Also we'll share who does the lesson... but for right now it's just Dave and I! The two hour block went better than I expected. The kids mostly listened to us, and did what they were supposed to. We had the old Leader in with us, so next week will be our first week flying solo. I think Logan had fun, but it was hard keeping the kids from stepping on his hands and tripping over him. He can't walk yet, and they tend to forget he's still small. 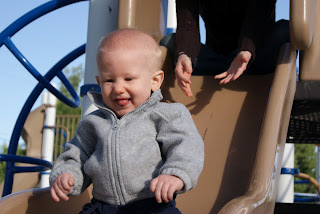 Mostly he was happy playing and snacking instead of being quiet in Relief Society/Priesthood! Tuesday Logan and I went to visit Alison and Andrea. We brought lunch and ate with them, shared some of our apricots (which Andrea probably ate 5 for lunch), and dropped of a few little things for baby Sarah (who is due in two weeks). It was fun to get out and have some play time with the cousin! Logan really loves playing with his cousin. This morning I woke up early to bake some cupcakes for April's baby shower on Saturday since it was so cool out and we could blow the cool in and not heat up the house. I got this idea from Pinterest to bake them in baby food jars and dye them all kinds of fun colors. They turned out cute, although there are things about them I would have done differently in the future (either make smaller dollops of each color of batter, or just do each jar a different color, also put less batter in each). I will freeze them today, then thaw and frost them on Saturday for the shower at noon. Dave and I have made this recipe a few times and we're completely in love with it! It's a little sweet, a little tangy (Logan loves eating rice with the sauce, so not too tangy), and incredibly healthy. Also gluten free if you use gluten free soy sauce. Since we have a 50 foot apricot tree, I'm always in search of Apricot related recipes. Place frozen chicken on the George Forman grill and cook until outside is done. Cut into strips and cook more until barely cooked thorough (you can cook any other way so the chicken ends up in bite size pieces, but this is how I do it). Cut into bite size pieces. We had a grand Father's Day yesterday! Saturday night Logan decided not to go to sleep until sometime around 3am (when I remembered to give him something for his teething pains...), so we woke up later than normal. I made Dave waffles with fresh strawberries from the garden and fresh apricots from our tree (and strawberry syrup). We spent a relaxing morning slowly getting ready for church, and put Logan down for his pre-church nap. Then we made our mistake. We laid down for a small rest... and woke up two hours after church started. Dang! I guess we needed the sleep, but we were sad to miss Father's Day Sunday. So spent the majority of the day playing with Logan, napping (during his second nap too), and eating delicious food. For dinner I made Steak (marinated in a Hawaiian bbq sauce), creamy mashed red potatoes, fresh green beans, and banana cream pie. I didn't make a whole pie, just two mini pies (we don't need to eat a whole pie between the two of us!) Everything was delicious and we had fun preparing it. I tried something new with the mashed potatoes. I chopped them up and threw them in the crock pot, covered them with water, and stuck them outside on the gazebo on high for 4 hours. By the time dinner was almost done, all I had to do was drain, mash and prep them. It was nice not to have to heat up the house just for the taters. They probably didn't have to cook that long, but that's when we felt like having dinner. We finished up the night by watching some Avatar (the cartoon series) and eating some fruit salad. Something about this time of year makes me want to consume mass quantities of fruit! On a different note, I had two library cards for almost 3 years now. One is to our little city library, and the other is for the library in downtown Salt Lake City. I got the one downtown when I was going to school at the U and was constantly passing the SLC library on my way to work/school/home on the train. When we moved to Taylorsville I got a second card fully intending to switch libraries, but sometimes there are books that the little library doesn't have. So I kept both cards. But now I have a real reason to have two cards. SLC library has electronic books for checkout and Taylorsville doesn't! So instead of being #224 on the list to read the second in a series, I picked up my electronic copy today! So nice, such short waits for popular books. I LOVE electronic books. It's been beautiful outside over the past week! We've been at "the park" almost every day of the week. 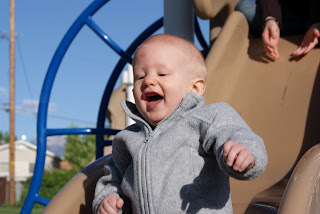 Most of the time we just go to the Elementary School across the street and play on one of their two playgrounds. Logan loves the slides best, but he also enjoys swinging. We'll play for hours, but whenever we leave he cries. Nothing major, but he has to protest leaving. Saturday Grandma Linda & Grandpa Bill came to the park with us. 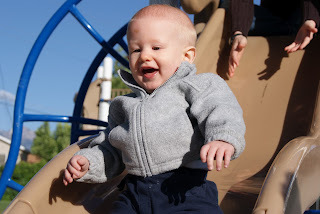 Although it was super windy and cold, Logan still had tons of fun, and we enjoyed watching him. Grandpa took all these great pictures! Sunday we had a family from the ward (the Dickes) over for a BBQ on Sunday. The youngest son, Sammy, was so enamored the strawberries from our garden that he refused to eat anything else. We were planning to play games after dinner, but the kids were too riled up, so we just played with them. It was fun to have them over, eat, and play. Monday we had FHE at Murray park. We brought a picnic dinner (sandwiches, pasta salad, and strawberries). After we slid down the slide and swung on the swings. 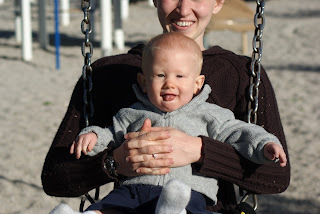 Our favorite part about Murray park is they have baby swings so Logan can swing by himself. He loves the freedom! The rest of the week has been good! Logan's still been getting into everything, but I'm afraid that's where we are at this point in life. He had a crazy day last week while I lift him in the living room for 15 minutes so I could shower. By the time I went to get him out, he had gotten everything off the coffee table (including my drink), the TV was on and he had unlocked my cell phone and dialed 911! Little punk. He's so close to teething on at least two teeth; I don't know why it's taking so long! The bottom right gums keep swelling, so I think we're close there (he already has the bottom left tooth). Also the top left is so close to popping out you can see the white tooth pressing on the bottom of the gums. It's so close! It's been rough around here lately! Logan (the baby with the longest teething record in the world) is still working on pushing out tooth 2, 3 & 4. He's ornery and still chewing on everything. Except now he's leaving marks on things because he has one little tooth. We've also been working on weaning him from swaddling (you'd think by 10 months he would be done with this). It's getting WAY too hot for him to sleep this way any more, so we're trying real hard! He has been doing good on his naps, but bedtime is hard for him. Last night I put him down and he was out, then Dave walked down the hallway... and he FREAKED out. So after an hour and a half of fighting, we swaddled him again and he went down. Speaking of hot... it's been in the 90's for about a week. It got up to 100 Monday! We've been trying not to put on the air, but after the 100 day, I couldn't help it. So sleeping has been affected. Finally last night a cold front moved in and I got some very needed sleep! Thank Heavens. Sunday was my 30th birthday! Something about being 30 makes me feel like I should probably be taken seriously. Or at least the cashiers at the grocery store will stop carding me for white out, glue and over the counter drugs. A girl can hope, right? But I do love getting older, it's fun to start a new decade of my life. Dave was so sweet and bought me a Kindle! I didn't expect it at all, and have had tons of fun reading books on it so far. Dave's had tons of fun discovering Angry Birds on it. I told him he can have 2 apps on my Kindle at any time, so choose wisely. I also have the feeling I'm going to have to buy him one of these in the future so I can get full use of my toy. This week Logan learned to lock himself in his room. He crawls over to the door, pushes it shut, then crawls behind it, leans against the door and cries. Then I have to try to figure out how to get him to move so I can get him out of there. Usually it involves gently pushing him over and sliding the door open. But when he has his fingers under the door this presents problems. I even started putting a door stopper on his door, but he's figured out how to get that out of the way. He doesn't do it in any other room, just his bedroom.